Are you concerned about infidelity? Are you involved in a child custody dispute? Do you need a private investigator and don’t know who to trust? 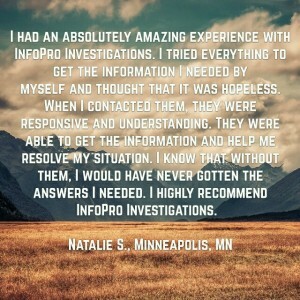 With over 25 years of investigative experience, InfoPro Investigations is a recommended Minnesota and Colorado Private Detective Agency you can trust. Our investigations have given our clients the information they need to make difficult personal and professional decisions. 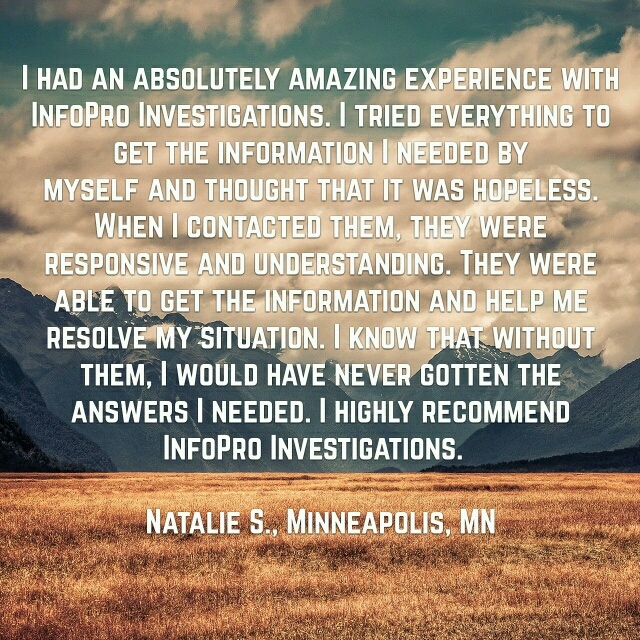 InfoPro Investigations was founded by a Minnesota and Colorado Private Investigator with over 25 years of investigative experience obtained with some of the world’s largest private detective agencies and a Fortune 500 Insurance Company. He has used his investigative skills to help people like you. The experience and skill he has gained has helped hundreds of our clients in the areas of Infidelity, Divorce, Child Custody and Complex Investigations. Recommended company you can trust…. InfoPro Investigations is an established Minnesota and Colorado Private Detective Agency that is waiting to work for you across Minnesota and Colorado or across the country. We will personally advise you from your free consultation until your investigation is completed. InfoPro Investigations is a recommended company you can trust to understand your problems, keep them confidential and help you solve them. All communication with InfoPro Investigations is strictly confidential regardless of whether or not you become our client. We will provide you with a free confidential consultation by calling (612) 302-8165 in Minnesota or (720) 418-8187 in Colorado. We will personally assist you and use our 25 years of investigative experience to help you find the truth.